DiDi is currently a goalkeeper with the Washington Spirit of the NWSL Women’s Professional League. She had an outstanding collegiate career at Loyola University between 2010 and 2013. In 2012, DiDi earned MAAC Player of the Year and helped Loyola win a conference championship and a bid to the NCAA tournament. She played for D.C. United Women between 2011 and 2012, making 7 appearances. In 2013, she was the starting goalkeeper for the Washington Spirit Reserves, posting a 0.580 GAA in 12 matches. She signed with the NWSL’s Western New York Flash in 2014 before transferring to Sweden and playing the remainder of the season with Krokom/Dvärsätt. 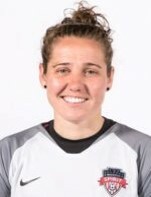 She signed with the Washington Spirit in 2016 as a back-up goalkeeper, until the 2017 season where she started in seven matches, totaling 630 minutes, and earning the NWSL Save of the Week honors in Week 22. DiDi is a Goalkeeper Coach with Arlington Soccer Travel teams (boys and girls) She is the Assistant Coach with the Varsity Girls’ Soccer Team at National Cathedral School, leading the team to a 2016 ISL League Championship. She is a former Goalkeeper Coach at ECNL for McLean Youth Soccer.